Preethi duped the literary world by leading a double life as her own PR consultant to get her novel noticed. It paid off! After her manuscript, Gypsy Masala, was rejected by most publishers, Preethi Nair left a lucrative career as a management consultant to set up her own publishing and PR company. Not having the resources to rent an office and publish her book, Preethi established a multinational in her bedroom and duly appointed feisty director, Pru Menon (an alter ego) to energetically and shamelessly hype her work. Nobody else knew of her scheme! Working as several different people and with a frenetic double, sometimes triple life, Preethi gained substantial press coverage for herself. And after two years and an amazing journey, her faith in her own talents and her perseverance in the face of consistent rejection were rewarded; she signed her three-book deal with HarperCollins. Preethi Nair won the Asian Woman of Achievement award for her endeavours. 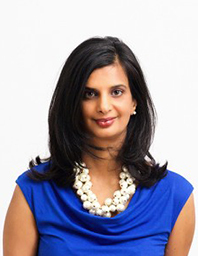 'Pru' Menon' (the alter ego) was short-listed for PPC Publicist of the Year! The BBC have bought 100 Shades of White for a television adaptation. Her latest book, Beyond Indigo, a fictionalised account of her extraordinary journey is released in September 2005. Preethi Nair also works as a travel writer for the Sunday Times, is a contributor on Radio 5 Live’s book panel and works with organisations to inject her unique brand of creativity into the work place.